German halakist, a descendant of a learned family; probably born in Bohemia; lived about 1200-70. He mentions as his teachers two Bohemian scholars, Jacob ha-Laban and Isaac ben Jacob ha-Laban (author of "'Arugat ha-Bosem"). Led by a thirst for Talmudical knowledge, he undertook in his youth extensive journeys to the prominent yeshibot of Germany and France. According to Gross he went to Ratisbon first; but S. N. Bernstein conjectures that previously he stopped for a long time at Vienna, and became closely identified with the city, as he is usually quoted as "Isaac of Vienna." From among the many scholars at Ratisbon he selected for his guide the mystic Judah ben Samuel he-Ḥasid (d. 1217). About 1217 he went to Paris, where the great Talmudist Judah ben Isaac Sir Leon (d. 1244) became his chief teacher. He also visited for a short time the yeshibah of Jacob ben Meïr in Provins (see Gross, "Gallia Judaica," p. 495). Then he returned to Germany, and studied under the mystic Eleazar ben Judah at Worms, and, at Speyer, under Simḥah ben Samuel, his intimate friend, and Eliezer ben Joel ha-Levi, author of "Abi ha-'Ezri" and "Abi'asaf" (see Zunz, "Z. G." p. 36). At Würzburg, where Meïr Rothenburg was his pupil (c. 1230), he became "rosh yeshibah." Later on Isaac returned to Ratisbon, and then settled for some time in Vienna, where he held the position of "ab bet din" and rosh yeshibah. Finally, he went to Saxony and Bohemia. Isaac lived a long but unsteady and troubled life, the facts of which are gathered from his "Or Zarua'," the only source of information. He saw the law compelling Jews to wear the yellow badge put into force in France, and he deplored the massacres of the Jews in Frankfort-on-the-Main (1241) and the extortions practised upon them by the nobles of Austria. His son-in-law was Samuel ben Shabbethai of Leipsic; his son Ḥayyim Eliezer, called "Or Zarua'," like him a scholar, carried on a comprehensive halakic correspondence, a part of which (251 responsa) was printed under the title "Sefer She'elot u-Teshubot" (Leipsic, 1860). Toward the end of his life, about 1260, Isaac composed his ritual work "Or Zarua'." He is usually quoted as "Isaac Or Zarua'." It was printed from the Amsterdam manuscript (incomplete) by Lipa and Höschel in Jitomir, 1862 (parts i. and ii. ); other manuscripts are at Oxford (Neubauer, "Cat. Bodl. Hebr. MSS." No. 650) and in the Jewish Theological Seminary of America, New York (MS. Halberstam No. 454). In the edition of Lipa and Höschel Seder Neziḳin is wanting; most of the rest of the work was afterward printed at Jerusalem by J. M. Hirschensohn (part iii., 1887; part iv., 1890) (Harkavy, "Ḥadashim gam Yeshanim," No. 10; Grätz, "Gesch." v. 20, Hebr. ed.). The "Or Zarua'" comprises the whole ritual, and is arranged according to the Talmudical treatises, while at the same time the halakot are kept together. The author, unlike Maimonides in his "Yad," does not confine himself to giving the halakic decisions, but gives also the passage of the Talmud, explains the subject-matter, and develops the "din" from it. Thus the "Or Zarua'" is at the same time a ritual code and a Talmudic commentary. As it contains, in addition, explanations of some passages in the Bible, the author is also quoted as a Bible commentator. Moreover, the book contains a part of the halakic correspondence which the author carried on with Talmudical scholars of Italy, France, and Austria. Older collections of halakic decisions ( ) which the author had gathered together during his lifetime seem also to be embodied in the work. Isaac explains unknown words in Bohemian ( ), his mother tongue (see Harkavy, "Die Juden und die Slavischen Sprachen," pp. 53 et seq. ), and cites the Talmud of Jerusalem, to which he ascribes great authority in halakic decisions. The work is introduced by a treatise couched in words to whose meanings mystical significance is attached. It is an imitation of the Alphabet of Akiba ben Joseph, and was composed at the order of Isaac's teacher Eleazar ben Judah of Worms. Isaac's son Ḥayyim Eliezer arranged a compendium of this work which exists in several manuscripts. The "Or Zarua'" succeeded in displacing all the older ritual works. It is very important also for the "Culturgeschichte" of the German Jews in the Middle Ages (see, for instance, Berliner, "Aus dem Leben der Juden im Mittelalter," on almost every page). 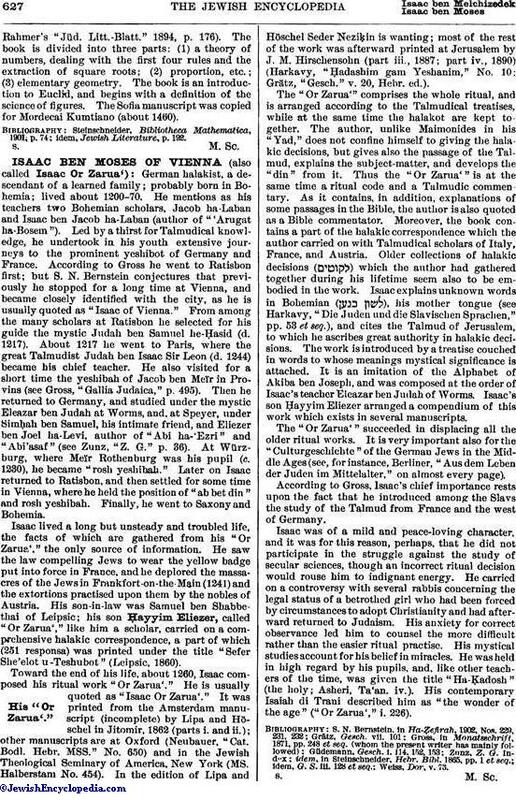 According to Gross, Isaac's chief importance rests upon the fact that he introduced among the Slavs the study of the Talmud from France and the west of Germany. Isaac was of a mild and peace-loving character and it was for this reason, perhaps, that he did not participate in the struggle against the study of secular sciences, though an incorrect ritual decision would rouse him to indignant energy. He carried on a controversy with several rabbis concerning the legal status of a betrothed girl who had been forced by circumstances to adopt Christianity and had afterward returned to Judaism. His anxiety for correct observance led him to counsel the more difficult rather than the easier ritual practise. His mystical studies account for his belief in miracles. He was held in high regard by his pupils, and, like other teachers of the time, was given the title "Ha-Ḳadosh" (the holy; Asheri, Ta'an. iv.). His contemporary Isaiah di Trani described him as "the wonder of the age" ("Or Zarua'," i. 226).